We’re coming down to the wire for a gift for dad on Father’s Day. It’s coming up this Sunday, June 16th. Are you ready? Do you have a gift for him? 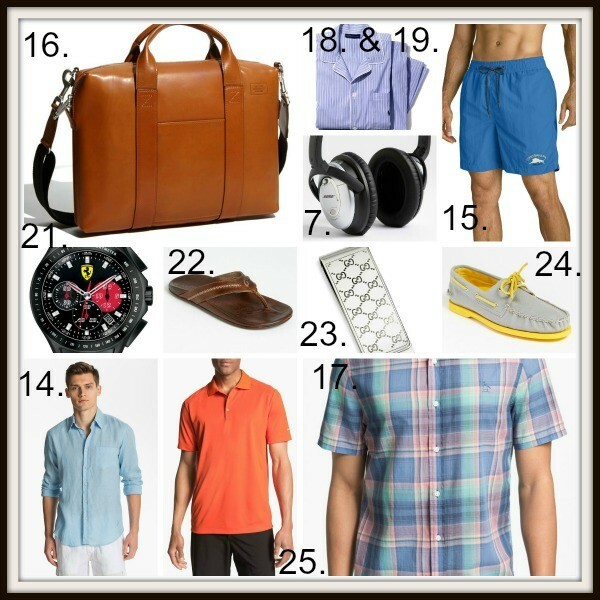 Dads can sometimes be a little difficult to buy for, but thanks to places like Nordstrom, we have some fabulous ideas for you today. From Ray Bans and flip flops to swim trunks and boat shoes, there’s bound to be something for your special dad. 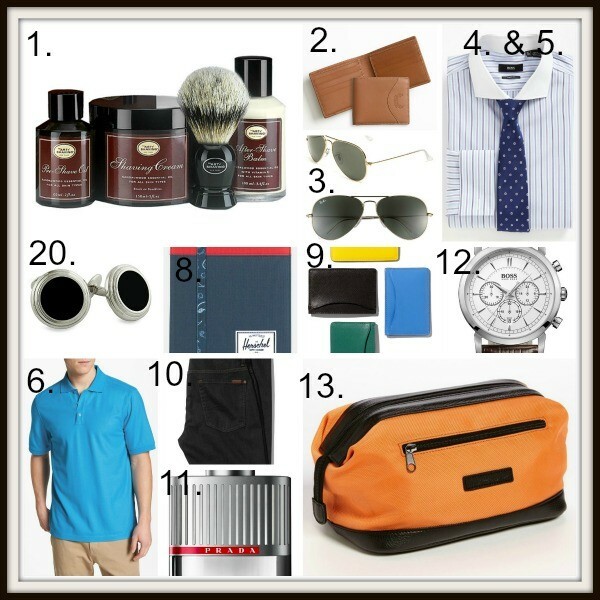 Enjoy our list of gift ideas for dad! 1. The Art of Shaving ‘The 4 Elements of the Perfect Shave’ Kit, $115. 2. Ghurka Classic Leather Wallet, $195. 3. Ray-Ban Aviator Sunglasses, $145. 4. Boss Black Dotted Tie, $120. 5. Boss Black Sharp-Fit dress Shirt, $105. 6. Nordstrom Regular-Fit Pique Polo, $45.50. 7. Bose ‘Quiet Comfort’ Acoustic Noise Cancelling Headphones, $299. 8. Herschel Supply Co. ‘Cypress’ iPad Sleeve, $35. 9. Jack Spade Crosshatched Leather Card Holder, $45. 10. 7 For All Mankind ‘Austyn’ Relaxed Straight-Leg Jeans, $178. 11. Prada ‘Luna Rossa’ Eau de Toilette, $62-$82. 12. Boss Black ‘Classic’ Round Chronograph Watch, $335. 13. Nike Ballistic Nylon Travel Kit, $60. 14. Vilebrequin ‘Caroubier’ Linen Sport Shirt, $200. 15. Tommy Bahama Relax ‘Happy Go Cargo’ Volley Swim Trunks, $65. 16. Jack Spade ‘Davis’ Leather Briefcase, $425. 17. Original Penguin Trim-Fit Short-Sleeve Plaid Shirt, $79. 18. Polo Ralph Lauren Pajama Top, $44. 19. Polo Ralph Lauren Pajama Pants, $42. 20. David Donahue Onyx Cuff Links, $225. 21. Scuderia Ferrari ‘Race Day’ Chronograph Watch, $295. 22. OluKai ‘Mea Ola’ Flip-Flops, $120. 23. Gucci ‘Icon’ Silver Money Clip, $190. 24. Sperry Top-Sider Boat Shoes, $84.95. 25. Nike ‘Victory’ Polo, $50.